Kit preview of Revell's Space Jet Glador. Scale: None stated; about 3" tall, 10" long and 8" wide completed. Molding Quality: 9 - no visible surface defects. Detail: 8 - Raised panel lines, sharp raised and engraved shapes. Overall Rating: 8 - looks like a good weekend project. Perry Rhodan® is supposedly the most successful sci-fi series ever, having been published weekly continuously since 1961. There are now over 2000 "editions", which have been collected in over 400 paperbacks alone, and spawned everything from comic books to PC games, and even a "soundtrack" (Perry Rhodan: Pax Terra) by Christopher Franke. Yet you've never heard of Perry, you say? Not surprising, actually - unless you're German. The serials are printed in Germany (though there are English, Japanese and other language editions available), where they are as familiar as Star Trek is in the US. Perry's story spans almost 5 millennia, starting from his birth in 1945. Along the way, he has been everywhere and done everything, essentially, including being the first man on the moon, first person to contact extraterrestrials, and the leader who brought humanity to the stars. 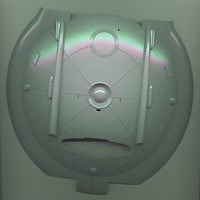 Revell (Germany) released three kits of spaceships seen in the various stories: the Space Jet Glador, Starship Sol, and Space Base Marco Polo. Where they fit in the saga, or even who they belong to, I have no idea. I just saw pictures of them and thought "Cool!". However, the sci-fi modeling scene being what it is at hobby shops in the Chicago area, I did not see any of the kits anywhere. I even had a hard time finding them on-line, until (on a whim) I checked with Hannants, a British firm. They're reliable, reasonably priced, and as long as you meet the minimum order of £30 GBP they'll ship anywhere in the world. The outside of the flimsy box is considerably more colorful than the Revell kits one normally sees here in the US, with a bright painting of the subject against an asteroid field. Inside the box is more familiar. 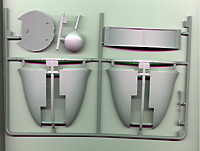 Two bags contain all 27 parts; one sprue tree with various detail shapes, plus the upper and lower halves of the main hull. The kit is actually pressed in Poland, and the styrene is atypical of the models I've built from Polish manufacturers - hard and very smooth. It's not so hard as to be brittle, however, and it does sand easily. There's no flash or sinkholes anywhere, and no visible defects on the exterior surfaces of the parts. There are small ejector pin marks on the interior surfaces, but since there is no interior (and no clear parts to see it with anyway) that's no problem at all. Evidently, someone spent some time engineering the model to make it easier to paint; Most parts that require a different color from the overall base are molded separately - so one can paint them separately. 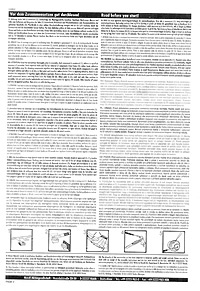 Instructions are provided in the usual exploded diagrams, broken into seven steps, on the usual cheap newsprint. Paint call outs are provided for detail parts along the way. A full painting and decal placement guide is also provided. How accurate it is, I can't say .... and frankly, I don't much care. A short bio of the ship and the usual fine print in fourteen languages warning the modeler not to hurt himself (or herself) round out the package. The decal sheet (about 4" x 6") provides plenty of colorful markings, in English and something that looks like graffiti, for just the one ship. They're also typical Revell - well printed, perfectly registered, and absolutely dead flat (matte). Based on previous experience with Revell decals, I can tell you that surface preparation is critical. They'll stand up to the heaviest setting solutions a modeler can bring to bear against them. Good thing, too, as they will need liberal doses of solvent to lay down well. The clear areas are prone to silvering, even with setting aids, so I'll lay them down on a puddle of Future (Kleer, in Europe) acrylic floor polish. 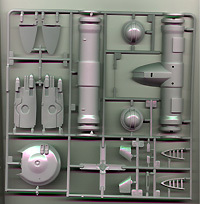 Revell kits run the gamut from well-fitting (aircraft, generally) to not very well-fitting at all (ships, generally). Though I've only assembled the hull halves, and test fit some other other subassemblies, it appears this is one of the better fitting models. There will be a few seams to sand down, but if one is careful, not much putty should be necessary.. 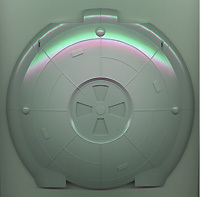 The kit's smooth surface should make it a perfect candidate for a metallic finish. The instructions call for a base color of "Grey, Silky-Matt", with contrasting areas of "Grey, Silky-Matt", whatever the heck those are. I think I'll go for a dull aluminum color with a darker metallic grey, though photos of the completed model show a light grey and a darker blue-grey scheme. The box art suggests some weathering is in order as well. No stand is provided, nor is there any hole for one, so you're on your own if you don't want to just toss the completed model on the shelf (you'll be too busy zooming it around the room and strafing the cat with it anyway). This looks to be a decent kit, easily assembled and finished - a great weekend project, or change of pace from super-detailing the usual Trek subjects. It's also a kit I can recommend to even a novice - the box may show a skill level three rating, but the small number of parts and the decent fit make this one easier than the first glue kit I made (at age 8, back when there were no snap-together plastic models, at least not in Detroit). I look forward to building it! Perry Rhodan USA - Official English-language site, run by the company that publishes the English language translations. Many thanks to my wallet for providing the review sample. Manufacturers and retailers, interested in getting your wares reviewed and publicized? Contact us! This page copyright © 2000 Starship Modeler. Last updated on 14 January 2000.